Anxiety is a natural human experience sometimes with positive results as it serves to protect us from dangerous environments and helps us make informed and rational decisions. Sometimes however, it can affect our ability to perform normal activities as it is a symptom of suffering from a phobia. Many people who travel by air experience some degree of anxiety or caution, especially in recent times when terrorist activity seems to dominate the news. If this anxiety is heightened, flying can become a very distressing and uncomfortable experience. Anxiety occurs from excessive worrying, this can be worry over a particular person or scenario or from an accumulation of life stresses. It can manifest in both physical and psychological symptoms, causing discomfort, feelings of doom and an overall sense of uneasiness. Many specialists believe that along with anxiety being a learned behaviour from parent to child, but may also actually be passed down via genetics also. Experiencing anxiety due to a fear of flying can be extremely limiting to an individual, with the possibility of causing loss of contact with family and friends, limiting job opportunities and prevent or ruin otherwise enjoyable family holidays. Sufferers of anxiety, whether from flying or because of another reason will probably suffer from all or just some of the following symptoms: excessive worrying, restlessness, lack of concentration, irritability, muscular tension, sleep disturbances, distressed breathing, changes in appetite or a dry mouth. As the anxiety grows, so do the symptoms, often until strong physical reactions are experienced and a panic attack develops. There are many treatments for anxiety such as medications, therapy, counselling, relaxation exercises, breathing exercises, support groups and improving general fitness. Medications should only be used as a short term option and only after deep discussion with the GP to find the most suitable type and dose. Many therapists and counsellors will seek to find the origins of the problem and suggest new and more positive methods of managing thoughts and thought processes. Relaxation and breathing exercises are both achievable at home and without great expense, they can be very valuable for managing many of life’s stresses and can improve general health by regulating respiration and heart rate. Keeping a good level of general fitness will increase the production of endorphins (feel good chemicals) in the blood helping the individual feel more positive about life and have a greater ability to gain control over situations. Support groups can provide the individual with a network of understanding and sympathetic ears that can also suggest ways of managing the anxiety and viewing worries from a new perspective. Individuals whom are experiencing anxiety from aerophobia can help improve their condition by employing a number of different techniques. Planning a holiday or flight, or when actually arriving at the airport can feel very overwhelming to the aerophobic sufferer, so breaking down the experience into smaller and more achievable tasks can be a simple way of ensuring that the overall task is most likely to be achieved. Small measures such as congratulating or rewarding oneself after every step can help reduce the intensity of each task and can allow the person to feel a sense of achievement. 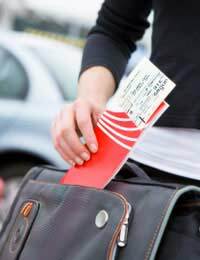 Use distraction methods for passing time; do not circle the floor of the airport to kill time, instead read a good book or take a selection of magazines to read whilst waiting to board and during the flight. Crosswords and competitions can prove to be very valuable as they require concentration and can act as a focal point for the journey. Portable music players can be extremely useful as the right type of music can help relax the brain, therefore the muscles, and help to regulate breathing, lessening the symptoms of anxiety. They also serve to ‘block out’ airport noise that can add to a person’s distress. There are many times in life when anxiety can prove to be a positive experience, though there are ways of trying to reduce it allowing us to pursue all the events and challenges that we wish to achieve in our lives.